180-degree harbour views and glamour. Don’t be intimidated by its size and glamour, Foxglove Bar and Kitchen offers shelter from the wind in the heart of the Capital’s waterfront precinct. Take a walk along the waterfront until you see the bright lights of the Foxglove sign, then step inside to explore a very foxy space in Wellington. 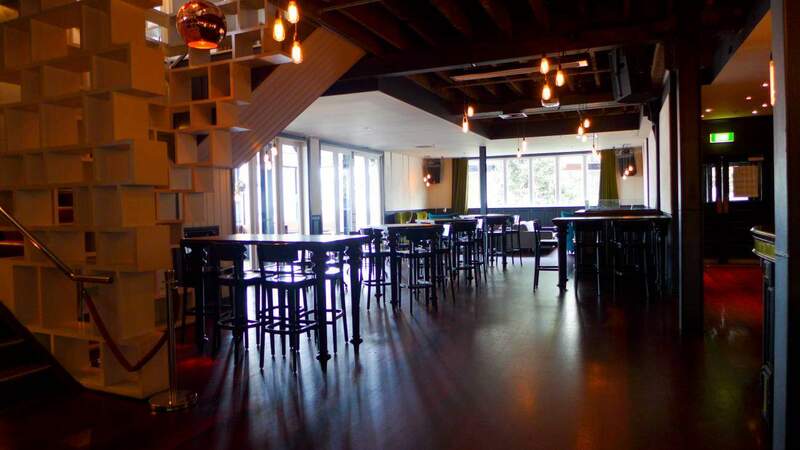 In 2010, Foxglove owners transformed the former Greta Point Tavern - transported to its current location by barge in 12 pieces - into a series of smaller spaces with an air of 1940’s glamour. The lobby bar on the ground floor is perfect for a Friday night drink on oversized armchairs and couches, while the upstairs Brass Monkey Bar and Games Room provides space for a bigger night out. Staying upstairs, The Sitting Room is perfect for a relaxed wine with friends – on hot pink velour swivel chairs nonetheless. The Bar menu offers a unique range of snacks to nibble on while swiveling – my friends and I usually go for the Sicilian olives, pickled garlic & lemon ricotta ($7) and Foxglove fries, parmesan and truffle ($9). The Foxglove balcony also spans around the top floor, offering cool wicker lounges to take in the 180-degree harbour views. The Foxglove Champaign and Cocktail bar can also be found upstairs through an old oak wardrobe – arguably one of the best spaces for private functions in the Capital. But to bring things down to size, the Foxglove dining room is great for a city treat, offering the same menu of small bites, charcuterie, gourmet burgers and larger plates. I went to the dining room with family as a treat, ordering the Grain fed pork chop, pumpkin, olive, pine nut crumble ($32) from the dining room menu. The pork was cooked beautifully, and although the portion was fine-dining small, the pumpkin olive and pine nut crumble was the perfect winder treat. My mum ordered the Emerson’s lemon sole fish burger, watercress, sauce gribiche, with fries ($19.50) served on a wooden board – an upmarket take on a classic take-away. Both dishes went well with a glass of Marlborough’s Spy Valley Pinot Gris ($9.50 glass, $45 bottle). With six of us dining, Foxglove offered great service and a waterfront view for every family member. On every night of the week they have dining specials including “The Wind Up” from Monday to Friday, and “Mojito Weekend” across the entire weekend. The service is great, the décor one-of-a-kind, and as the Eastbourne Ferry departs right outside the bar, so why not continue your night out with a harbour cruise? It’s good to book ahead but walk-ins are welcome – either way there is sure to be both glamour and good food at Foxglove.